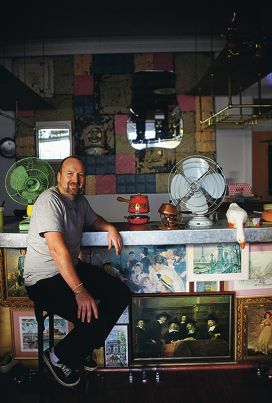 Iain Lawless at his soon-to-be open Mt Hawthorn bar, called Wee. ‘Mr Simpson has now provided the assurance that WALGA won’t be the go-between, with the proviso that if Pickard is there we’ll depart,’ Mosman Park Mayor Ron Norris said. All 30 of Perth councils were invited to meetings at WALGA’s headquarters in West Perth to potentially hear the State Government outline any plans to change local government, after discussions, failed merger talks and the Robson Review lasting about three years. The G4 ” Cottesloe, Claremont, Mosman Park and Peppermint Grove ” objected to Mr Pickard’s statements against small councils, and a fortnight ago asked to meet Mr Simpson alone at a new location. Mr Pickard said only a request from Mr Simpson would prevent him from attending the G4’s session at WALGA’s offices. ‘It is the prerogative of any mayor or president to decide if they wish to attend any meeting to which they are invited. However it also comes with the responsibility of deciding what could be either lost or gained in the decision not to attend,’ Mr Pickard said. He said small councils would benefit by ensuring their and the community’s interests were presented to Mr Simpson. Nedlands still wants to meet Mr Simpson by himself at another venue. ‘We’re not going to the (WALGA) meeting and we’ve refused to participate because WALGA was not an honest broker during reform discussions,’ Mayor Max Hipkins said. Subiaco was always going to attend at WALGA on May 28 to 29. ‘It will be an opportunity to hear from the minister, but what I will be asking is that if he is to do something it should be done quickly, as we have all been placed in limbo (because of the reform),’ Subiaco Mayor Heather Henderson said. Cambridge Mayor Simon Withers will join his council’s northern neighbours of Stirling, Vincent, Joondalup and Wanneroo at WALGA. Mr Simpson said councils at each of the meetings during the two days were not potential groups for new councils, but there was merit in local governments working together and with key industry bodies to achieve the best results.